Emphasizing on the need for education and empowerment of women, President Pratibha Patil on Tuesday asked state governments to launch projects to impart education to the girl child. It was imperative that the women must be educated and empowered to play a crucial role in development and poverty alleviation in the society, she said while inaugurating the legislative council’s centenary celebrations in the state legislature in Patna. The state governments should launch projects to give education to the girl childs in order to empower the women to play a significant role in the development process and poverty alleviation in the society, Patil said.The President praised the Bihar government for its several initiatives for giving education to the women, including 50 per cent reservation for the fair gender in the recruitment of teachers in the state. 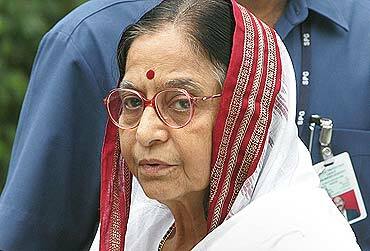 President Pratibha Patil today hailed the glorious history of Bihar which is the birth place of several legendary personalities who made pioneering contributions to various walks of life, including science, culture, religion and in the field of governance. “It was the auspicious land of Bihar where the ancient ruler Chandragupta Maurya laid the foundation of the Maurya dynasty which was said to the golden period the country,” she said at the legislative council’s centenary celebrations at the state legislature premises in Patna. He (Maurya) was succeeded by an equally illustrious son Chandragupta-1 who set up the Gupta dynasty in which some of the greats from the world of literature and science like Kalidas, Aryabhatt, Varasmihir, Vishnu Sharma, Vatsayayan and Pushpadutt were born, Patil said. “The state had several centres of academic excellence like Vikramshila and Nalanda universities during ancient times visited by students and intellectuals from across the world for studies and research,” the President said. She said Bihar was also a land of religions as Maharishi Valmiki composed the epic Ramayana in this state only, while the founder of Jain religion Mahavir was born in Vaishali, while Lord Buddha received enlightenment at Bodh Gaya. The Sikhs and followers of Sufism too have great affection for Bihar as the tenth Sikh Guru Govind Singh was born in Patna and his birth place Patna Sahib was a pilgrimage centre for the followers of Sikh religion from the country and abroad, Patil said. Even during the modern era, Bihar produced a great freedom fighter in Babu Kunwar Singh who valiantly participated in the first war of Independence against the British colonial rulers in 1857 and subsequently the father of the Nation Mahatma Gandhi visited Champaran in 1917 to lead another battle cry against the foreign rule from Patna, Patil said. Paying a glowing tribute to the state and its people, she quoted Gandhi as saying in 1947 at a prayer that it was Bihar that had given him national identity 30 years ago.